A conversation between myself and Fiona Fleming, one of my colleagues, about my love of all things feline resulted in a table in our office kitchen being set up to display a wonderful array of hand-made soaps from The Caurnie Soaperie in Kirkintilloch. The soaps have proven to be a great success with colleagues, who have placed hefty orders. The Soaperie – first opened in 1922 – makes fine soaps from locally sourced ingredients, and by using ethical processing methods produces soaps for both clear skin and a clear conscience. There is a vast selection to choose from including geranium & orange, lime & thyme, bog myrtle, patchouli, peppermint & sage, spearmint, and heather & lavender to name but a few. 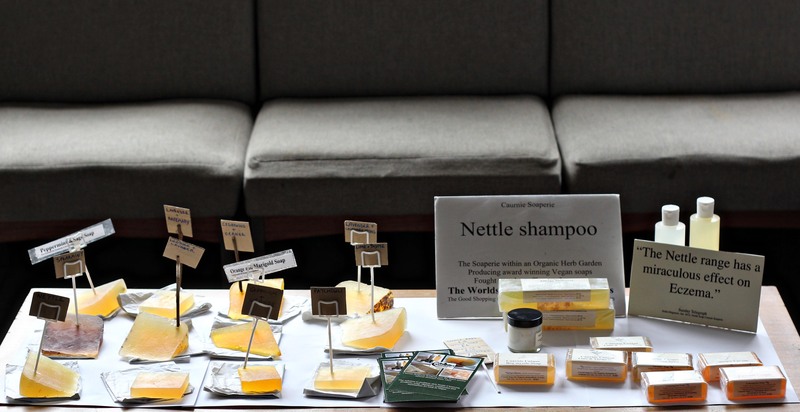 Shampoos, conditioners and moisturisers are also manufactured and the Soaperie’s Nettle range has been highly praised for its effective treatment of skin conditions such as eczema and psoriasis. All items are long lasting and reasonably priced. But where is the connection between the sale of soap and my adoration of cats? I was delighted to hear from Fiona that she is involved in selling soaps for Caurnie Soaperie at the Cats’ Protection annual Open Day at their Kirkintilloch Shelter but I was even more enchanted when I discovered that one half of the proceeds of her sales is donated to Cats’ Protection. Purrfect. This entry was posted in Charity and tagged Cats Protection, Caurnie Soap, Charity, Soap by Gillian Sinclair. Bookmark the permalink.